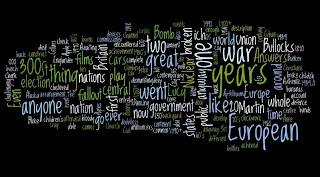 This here’s a Wordle of the front page of this blog. It’s a kind of designer word cloud, artistically arranged, for which you can set colours and fonts. It gives you some idea of the contents on a stream-of-consciousness level. Wordles are surprisingly engaging electronic playthings. Here’s another: More details and the opportunity to produce your own from any text you like, or blog, here. 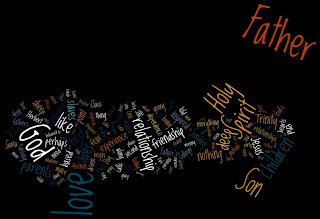 John, thank you for a fabulous discovery — wordles do indeed help focus what a sermon was actually all about in a visual way. Congrats on yours, and I've now posted mine from Trinity Sunday on the blog. Great way to find out if what we said was on message! 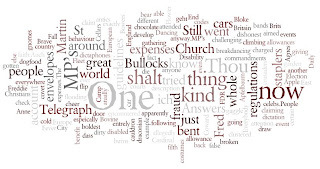 Thanks for this - I discovered Wordle when I did Nanowrimo last November. I'm about to give our vicar a shiny new website and I am just betting he wants to put sermons on it - any chance of a pointer to your discussion on this, which I'm afraid I can't manage to find in your archive? Everyone needs to be convinced in their own mind about putting recordings of their sermons on the internet. I don't want to suggest my idea's uniquely correct, but I did question the idea considerably after a parish changed their mind about wanting to meet a shortlisted candidate because his sermons on the Internet sounded so boring. It's very hard for any stranger to hear them as they would sound live and in context. Good Podcasts belong in the 1:1 media world of radio, where you feel the person is talking to you personally. Very few preachers can talk to 100 people and make it sound like that. The very acoustics of most Church buildings are against them. If you use it, interactivity sounds incredibly hesitant and clunky online whereas, if you were there, you'd see children coming up and doing things. I did put a reflection along these lines as point 5 here: http://bishopalan.blogspot.com/2009/05/social-media-church-and-bishopping.html . But if someone is able to make their sermons sound as exciting and engaging online as they do live, I'm all for it! A few years ago the home groups were given 5 sermons diced and audio sliced into bite sized chunks to discuss with our bibles at the ready. Don't go there. We did. We won't go again.